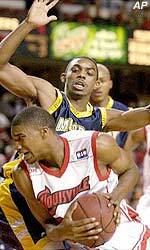 Burdine was an explosive 6-1 guard who played for the Racers from 1998 to 2002. A two-time AllOVC selection, Burdine had unmatched range and was a highlight reel dunker. He is 27th on the career scoring list with 1,209 points despite the fact that he only started 31 games in his career. He averaged 20.4 points as a senior despite starting just 22 of 32 games. He is fifth in career 3-point field goals made, 16th in career 3-point percentage and second in 3-pointers made in a single season.